Our main number to watch remains at the 10460 level on a monthly closing basis. Our Major Monthly Bearish rests down at 9860. Our critical support begins at the 10335 level during 2016. Once that gives way intraday, we can see this fall to the 98 level. We still do not see a final low for the euro BEFORE 2018 with the potential to bottom as late as 2020-2021. Our target for a turning point was February. That appears to have been accomplished during the week of the 8th. Now a weekly closing below 10927 will signal the start of the decline, but a daily closing beneath the 10715 level will be more definitive. We still need to look forward into March and May for turning points. 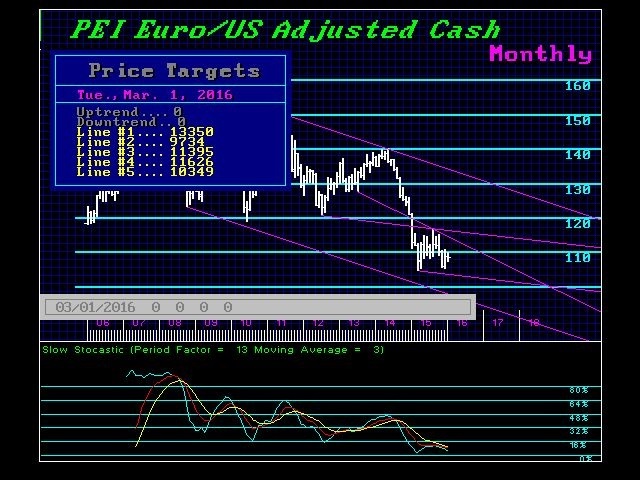 « Is The Pending Euro Collapse on Target From Our 2011 Forecast of 2016.202?